A small group of LTTE supporters gathered outside the Hotel Adlon Kempinski in Berlin to protest against President Maithripala Sirisena's visit to Germany. The group shouted slogans as he drove to the airport for a flight to Vienna. If one is to believe Karunatilake Amunugama, a one-time Chief of Protocol, a key player in the Foreign Office during the previous Rajapaksa administration and now Sri Lanka’s Ambassador in Germany, it was a “state visit.” He said so to the Colombo media and added that no Sri Lankan President had visited Germany in the past four decades. Despite the claimed “state visit,” it was only a lowly protocol official from the German Foreign Ministry who received President Sirisena. Foreign Ministry officials in Colombo say it was not a “state visit” by President Sirisena and was only an “official visit.” It becomes a “state visit” only if the invitation had come from the German President who is the Head of State. It becomes an “official visit” when the invitation comes from the Federal Chancellor, a senior official explained. Sri Lanka, however, ignores protocol when it comes to visitors to Colombo. German Foreign Minister Frank Walter Steinmeir visited Sri Lanka on an official visit weeks earlier. However, he was received by Minister Malik Samarawickrema and the Deputy Minister Foreign Affairs Harsha de Silva at the Bandaranaike International Airport and with drummers and children at the Foreign Ministry. There was a slip up at President Sirisena’s arrival ceremony. Ambassador Amunugama handed over a sheaf of betel leaves to Mr. Sirisena. It fell on the ground before reaching the President’s hands. Mr. Amunugama, due to retire in April this year, had to quickly squat to pick up the fallen leaves. A photograph that appeared in a State run newspaper depicting the scene has now become the subject of an informal inquiry. President Sirisena, upon reaching his hotel in Berlin, went to his suite to freshen up. He later went to a Thai restaurant there for lunch. On Wednesday he met the Sri Lankan community where the participants vied with each other to take ‘selfies’ with the President. Since he left early for another engagement, they had to be content with photo opportunities with Foreign Minister Samaraweera. There was some confusion over transport after the business forum ended on Thursday at the Maritime Hotel. Foreign Minister Samaraweera had to travel in the front seat of a Mercedes Benz. Behind were Ministers Karunanayake and Malik Samarawickrema. A small group of LTTE supporters, braving the winter cold carrying the flag banned in the European Union, demonstrated outside Hotel Adlon Kempinski where President Sirisena was staying. They shouted slogans through a loud hailer as he was leaving. 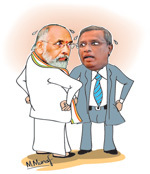 The battle between Northern Province Chief Minister C.V. Wigneshwaran and Tamil National Alliance (TNA) Parliamentarian M.A. Sumanthiran continues. The latest was after the new Northern Province Governor Reginald Cooray assumed duties on Friday.As politicians, officials and Tamil Parliamentarians were walking up to the Governor, the Chief Minister noticed that Mr. Sumanthiran was standing behind him. “Why are you silent these days? Aren’t there any allegations against me?” the Chief Minister asked. Mr. Sumanthiran promptly responded: “Nettrikann thirandalam kuttram, kuttram than” (A fault is a fault even it is seen by the third eye) – a reference to the belief that God Shiva opens his third eye when he wants to destroy if he is challenged). But, the differences between the Chief Minister and the rest of the TNA are currently the main topics discussed among the people in the north. Thailand has posted a Defence Attache in Colombo. He will function with residence in New Delhi. He is Captain Sittichai Tansjai of the Royal Thai Navy. Months ago, a hospitality venture chairperson defied the big boss and ignored calls to resign. Now comes the news that she has appealed to the angry boss to let her be in office till March this year, at least until the first phase of a refurbishment is complete. A source close to the boss said there has been no response so far. That means the original request to quit immediately stands, the source said. Dullas Allahapperuma, a former minister and Sri Lanka Freedom Party (SLFP – Mahinda faction) frontrunner travelled to South Korea. Barely had he acclimatised himself to the environment in Seoul, the Korean capital, did Mr. Allahapperuma realise that someone had hacked into his personal e-mail. That was bad enough. The hacker had also sent out a message, purportedly coming from the former Minister, seeking help to the tune of Rs 200,000 since he was in difficulty. Worse enough, the hacker, to authenticate his claim, has attached a photo copy with pages from Mr. Allahapperuma’s passport. So, it’s a case of both the e-mail account and the passport that have been hacked. He returned to Colombo on Friday.